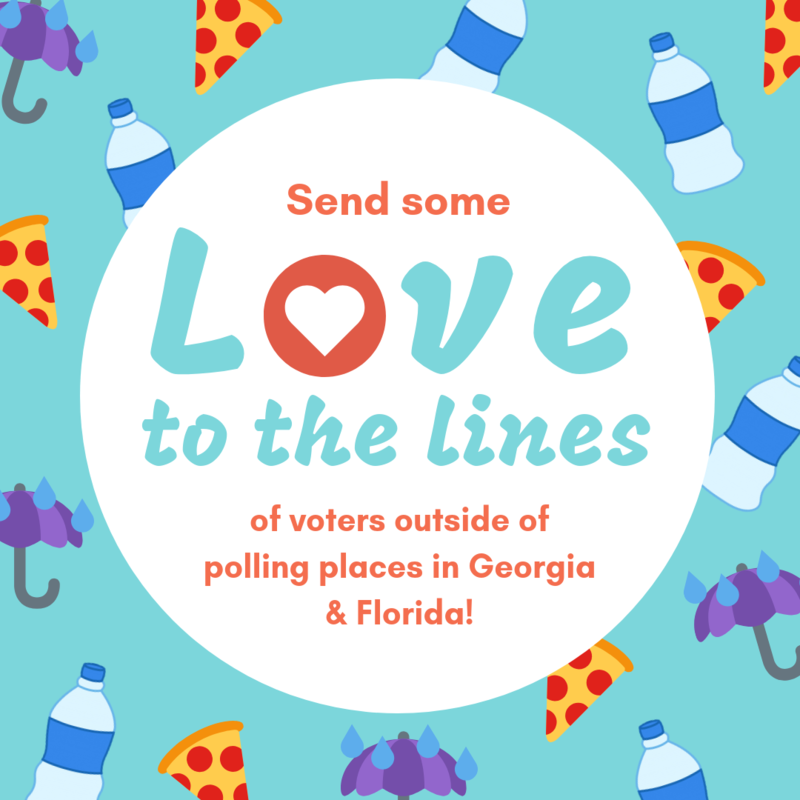 Send love to the lines of people waiting to vote outside of polling places on Election Day! Donate here and we will deliver pizza, snacks, and hot drinks to voters in Georgia and Florida. Sponsored by the National Domestic Workers Alliance and New Florida Majority Education Fund. This contribution is made from my own funds or the funds of an authorizing corporation or other entity, and the funds are not being provided by any other person or entity. ActBlue Charities is a registered charitable organization formed to democratize charitable giving. A copy of our latest financial report may be obtained by emailing info@actblue.com or calling (617) 517-7600. Alternatively, our report detailing our programs, a financial summary, and the percentage of contributions dedicated to our charitable purpose, along with a copy of our license, may be obtained from the following state agencies: FLORIDA (registration #CH46938) -- Division of Consumer Services 800-435-7352 www.800helpfla.com; GEORGIA (registration #CH012361) -- contact ActBlue Charities; MARYLAND (registration #29971) -- Secretary of State, State House, Annapolis, MD 21401; MISSISSIPPI (registration #100024326) -- Secretary of State, 888-236-6167; NEW JERSEY (registration #CH3867000) -- Attorney General, 973-504-6215, www.state.nj.us/lps/ca/charfrm.htm; NEW YORK (registration #45-25-27) -- Attorney General, Charities Bureau, 120 Broadway, New York, NY 10271; NORTH CAROLINA (registration #SL009830) -- State Soliciting Licensing Branch, 888-830-4989; PENNSYLVANIA (registration #104758) -- Department of State, 800-732-0999; VIRGINIA -- Office of Consumer Affairs, PO Box 1163, Richmond, VA 23218; WASHINGTON (registration #37969) -- Secretary of State, Charities Division, Olympia, WA 98504-0422, 800-332-4483; WISCONSIN (registration pending) -- contact ActBlue Charities; WEST VIRGINIA (registration pending) -- Secretary of State, State Capitol, Charleston, WV 25305. Registration with and reporting to these agencies does not imply endorsement, approval, or recommendation of ActBlue Charities. ActBlue Charities is a qualified 501(c)(3) tax-exempt organization and donations are tax-deductible to the full extent allowed under the law.